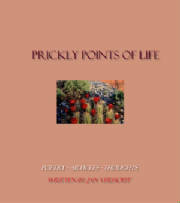 Jan Verhoeff, a full time writer, artist, home school mom created "Prickly Points of Life" out of a desire to share the joy she found in her life, even during those times of trial and travesty, and the victory she found as she overcame those trials. Having built her 'bread and butter' income in the business industry, Jan strives to share her knowledge and interest in helping people through her writing. With more than 500 published articles to her credit, Jan continues to participate in a writer group in her home town area, and work toward the publication of her manuscripts in other fields of interest. Prone to search for the intense, the different, the adventurous, Jan found her interest in writing developing into something more than the typical job. With an artist's eye for creativity and challenge, the opportunity to change the world with her unique perspectives and progressive point of views, Jan reaches out to her audience, touching their hearts with hope and love. Jan encourages others to express themselves through writing and art. Her son Kenton recently wrote a book about his interests. 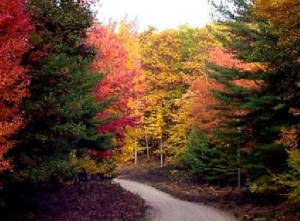 Veiled in a mist of fog, colors of autumn reveal more than any other the blessings of life. With harvest near to come, or recently past, vibrance and prestige come with color. Traveling through the country, it is a blessing to see the leaves change, and watch the colors of harvest. Jan Verhoeff lives just west of the Great Plains, and just east of the Rocky Mountain foothills of Colorado with three of her four children, and a wild skunk called Manhattan. (No he doesn't live in the house, he just thinks he does.) Her wild imagination and fortitude have given her courage to step into the future and live the life of her dreams. Jan spends her days writing, painting, and home schooling her children. Her nights she saves for worrying about child number four who is diligently preparing for a career in Criminal Justice after college. Jan's perpetual desire to learn originally focused her writing in the Business Industries, where she writes motivational and marketing articles for a variety of publications. Her first book publication, self-published in 1991, sold more than a thousand copies in a local business market. Later publications include: "Stories for the Trail" (with other Authors), "Words To Ponder - One Woman's Thoughts", "Prickly Points of Life", "Recipes from Jan's Kitchen", "Focus on Function", and "Put Your Thoughts In Print". More recently, Jan's writing interest leans toward mystery and behavioral humor. Both are included in her latest endeavor due to be released in March 2005 "Out of the Box", a publication about the triumphs and joys of home based education, and the processes she's found that work best with her children and others. Sometimes a writer needs inspiration, and I've found this book to be incredibly inspiring. It offers topics and ideas, and often presents me with thoughts I might never have come across.